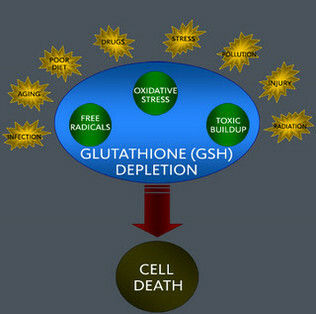 Glutathione plays a role in not only fighting cancer but some studies suggest it may actually target carcinogens (cancer cells) making them water-soluble and escorting them from the body. Although Glutathione, a tri-peptide, is not technically an amino acid, it is heavily influenced by three specific amino acids; cysteine, glutamic acid, and glycine (part of our Urine Amino Acid Profile) and is produced in the liver. This powerful antioxidant is primarily stored in the liver where it destroys harmful toxins to be excreted and the remainder are released directly into the bloodstream to support/strengthen the immune system. It does this by protecting the white blood cells and supporting the constitution of the red blood cell. In addition, it also assists the tissues of the arteries, brain, immune cells, lenses of the eyes, liver, lungs, heart, carbohydrate metabolism, and appears to exert anti-aging effects. Please consider checking your Glutathione level, especially if you are taking any of the statin medications due to the possible interference in our body’s natural glutathione manufacturing process. It is not always necessary or even recommended to take Glutathione supplementation but instead to provide your body with the nutrients it is lacking (see the amino acids referenced above) to increase Glutathione production. The Glutathione Blood test is reasonably priced and includes the doctor order, draw fee, shipping fees as well as your written report and free group telephone conference call (calls are scheduled once per month) to explain the test. Your Future Health Glutathione Blood is a stand alone test and does not have to be ordered with any other.